Well, for those of you familiar with my site, you know that pulled pork is an obsession in my household. We experiment with different sauces, cooking techniques, pork cuts, and dry rubs. One thing is for sure, no matter who we are entertaining, there is a pulled pork recipe for their taste! This recipe features a thick, tomato-based sauce with a hint of brown sugar and spice. 1. Place the pork loin in the slow cooker, fat side up. 2. In a large bowl, combine the remaining ingredients. 3. Pour the sauce over the loin making sure to completely coat the meat. 4. Place the lid on the slow cooker. 5. Cook on HIGH for 4 1/2 hours or on LOW for 7 hours. 6. After the meat has cooked, use a fork and pull the pork into long threads. 7. Completely coat in the sauce and allow to sit for an additional 20 minutes, allowing the sauce to soak into the pork. The cole slaw I grew up with was mayonnaise based and sweet. Although I do still use mayonnaise, I have cut back drastically from the traditional. Instead of being completed coated in a heavy sauce, this cole slaw is lighter but still retains all the flavor. You can use this side for fish, chicken, beef, or pulled pork or even as a condiment for your sandwiches! This recipe is so multi-purposed that the possibilities are endless. A great return for very few ingredients! 1. Place the shredded cabbage in the bottom of the mixing bowl. 2. Add 2 Tablespoons Mayonnaise, 2 teaspoons White Vinegar, 3 teaspoons Sugar, 1/4 teaspoon Salt, 1/4 teaspoon Black Pepper to the cabbage. Thoroughly mix the ingredients. It will be dry to start with, however, do not add extra ingredients yet. Keep stirring and the slaw will start to come together. 3. TASTE! This is a very important step. This is where you will need to add extra salt, sugar, or mayonnaise. The reason it is not an exact science is because you have to take into account the slight variation in moisture and taste of a head of cabbage. Add in small increments until it is slightly creamy and has a nice salt/sugar balance. 4. Cover a refrigerate for at least 30 minutes before serving. Chicken casserole is a staple in my house. I do several variations, but my husband's is the most simplistic one there is! A lot of Southern cooks make casseroles with cream based soups, but I, personally, do not like cream soups. I think that once you try this recipe, you will understand the difference in flavor. This casserole is creamy, full of chicken, and topped with homemade stuffing on top, slightly crisp and golden brown. I made this actual casserole for my husband as I was having to go away on a work related trip so that he would have something delicious for dinner at night. This meal keeps well in the refrigerator and can even be made ahead and then baked on the night of serving. 1. In a large stock pot, place the chicken, breast side down, and cover with water. Season with salt and pepper and then cover with a lid. Bring to a boil over medium-high heat. Boil for 45 minutes. After the chicken is cooked, remove to a baking sheet to cool. Set the broth aside. 2. In a large skillet, melt the butter/margarine over medium heat. Sprinkle the flour into the pan to create the base for the sauce. Allow to cook for 1-2 minutes, stirring occasionally. This step eliminates the flour taste. Using a whisk, continuously stir while adding in the reserved broth and milk. Whisk until smooth. Reduce heat to medium-low. Seasoning with pepper and allow to simmer for 5 minutes, stirring frequently. 3. While the sauce cooks, being to shred the chicken. Use your hands to remove and skin and fat. Shred the chicken into thin strips. Place in a mixing bowl. 4. Pour the sauce over the chicken and stir to combine. 5. In another large bowl, combine the ingredients for the topping. Carefully stir to thoroughly coat the bread cubes with the seasoning and liquid. 6. Spread the chicken and sauce mixture into a 9x13 baking dish. Top with the bread mixture. Sprinkle the top of the casserole with the remaining butter/margarine. 7. Place, uncovered, in the preheated oven and bake for 15-20 minutes. You only want to bake until bubbling and golden on top. 8. Allow to cool for 5 minutes before serving. NOTE: I like to make my own bread cubes. For this recipe, I used half a loaf of wheat bread that was beginning to go stale. Simply cut into cubes and then toast in the oven for 10 minutes on 350 degrees, stirring occasionally. Last Thursday, I was privileged enough to be invited to a wonderful luncheon that I look forward to every year. This event is always catered and typically features chicken, various sides, and an assortment of homemade pies. Don't get me wrong, I LOVE CHICKEN, but this year, they mixed it up. Instead of the typical chicken lunch, we were treated to a tender, thinly sliced roast served with pan gravy and potatoes. When I took the first bite of the meat, I was taken back to my childhood. When I was growing up, I remember, very clearly, my nana's stewed beef piled high over a bed of creamy mashed potatoes. The meat was so tender that it literally fell apart. The gravy was flavorful, but simple. I loved this meal! Now, I will be honest, I have tried several times to replicate this meal over the past 4 years with no luck. So when I decided that I had to find out what I was doing wrong, I immediately picked up the phone and called my mother. Much to my surprise, my biggest mistake was that I was trying to make it too complicated. This meal is about the simple flavors of the beef, the pressure cooking to tenderize the tough cut of meat and the creation of the gravy while the meat cooks. Finally, success! I hope you will try this recipe. I love it over a bed of creamy mashed potatoes, however, you can also serve it over rice. 1. In a large zipper bag, combine the flour, salt and pepper. Place the beef cubes into the bag, seal the bag and shake to completely coat, making sure to separate the cubes of beef from each other. 2. In a large pressure cooker pot, place a thin layer of vegetable oil (I started with 2 Tablespoons) and heat over medium heat until hot. 3. Using tongs, remove the beef from the flour bag and shake off the excess coating. Place in the hot oil and brown for approximately 2 minutes per side. NOTE: Do not overcrowd the pan. They must brown in a single layer. I had to cook mine in 4 batches, removing them to a plate until ready to move to the next step! 4. Add additional oil, if needed, to cook the meat. The beef will not be cooked throughout at this point! This step is only to help set the crust as well as create some flavor deposits on the pan to make the gravy. 5. Return all the meat to the pan and fill with enough water to just come to the top or barely cover the beef. The more water you add, the thinner the gravy will be in the end. I used 1 1/2 cups. 6. Secure the lid to the pressure cooker and set it to the LOW pressurization setting. 7. From the time of pressurization (when the "jiggling" or steam release begins) cook the meat for 35 minutes. After the 35 minutes of pressure cooking, remove from heat and allow to depressurize naturally. The beef will continue to cook during this time. 8. Once the pressure has been released, remove the lid and return the pot to the burner. Allow to simmer on low heat for 5 minutes. Taste the gravy at this time. If you need to add additional salt and pepper, do so now and allow to simmer for at least 2 minutes after the additional seasoning is added. 9. To serve, create a bed of mashed potatoes and spoon the beef and gravy over the top. We love a good hamburger. When we really want to go all out, we go for the bacon, cheddar, and, if feeling really indulgent, a fried egg! However, lately, we have really been trying to cut back on the rich foods and revamp our favorites into lighter favorites. If you are like me, I am sure you are skeptical of a juicy burger from lean beef; however, the key is a slow, lower cooking method and the addition of finely minced onions for moisture. This recipe is definitely a winner for a lower fat burger. 1. Place all ingredients, minus oil, in a large bowl. Using your hands, thoroughly combine without over working. 2. Press the burger mix flat and then use the side of your hand to evenly divide into quarters. 3. Pat each quarter into patties of desired thickness, using your thumbs to create a small well in the center. This will help them to cook more evenly. 4. Place on a preheated cast iron skillet over medium heat coated with vegetable oil. Cook to desired doneness, approximately 7 minutes per side gets ours to medium well. 5. Serve on a toasted bun with your choice of toppings. Note: Since this is a lean cut of meat, you want to cook them slower in order to prevent them from being tough and dry. Your cooking time will vary depending on your grill and the thickness of the patty. I think that when people think about potato wedges, they automatically assumed that they have to be fried in order to get the crisp coating. Here in my county, there is something called Holly Taters. These are fried potato wedges with a seasoned bread coating on the outside; these are staples at church gatherings! While I appreciate the heritage of the recipe, I find that the coating gets a little soggy and, if not eaten immediately, the potatoes taste greasy. This recipe is an adaptation from my standard oven baked wedges with an Italian twist. Your family will like these so much that you will want to make them all the time! 1. Peel the potatoes. Using a large knife, cut in half lengthwise and then each half into 4 wedges. Place the wedges in a large bowl of cold water. 2. Melt the margarine and then place the garlic in the margarine. Set aside. 3. In a large, resealable bag, combine the flour, parmesan, salt, pepper, and Italian seasoning. 4. Remove the wedges from the water and shake off the excess water. Place in the bag and seal the top. Shake vigorously to combine. 5. Line the wedges in a single layer on a large baking dish that has been thoroughly coated with non-stick cooking spray. Spoon the garlic and margarine over the wedges. 6. Place in a 375 degree oven and bake for 55-60 minutes, carefully flipping once after 30 minutes. My husband is a cheesecake fanatic! He loves all kinds of cheesecake.......chocolate chip, cherry, dutch apple........any kind! However, I will say that this recipe is truly close to our heart. Picking peaches from the family trees is an annual tradition for the two of us, and every year, we spend that evening peeling and canning the fruits of our harvest to last us throughout the year. The peaches used in this recipe come from a quart of our fresh peaches, preserved without additional sugar. You will love the creamy cool cheesecake paired with the sweet peaches. It is the South on a plate! 1. Combine the crust ingredients and use a fork to combine. Pour into a 10-inch springform pan and press down firmly to form the bottom and side crust. You can also use a glass to help push it up the sides. Place in the refrigerator to set. 2. Place the cream cheese in the bowl of your stand mixer fitted with the whisk attachment. Beat on medium speed for 3 minutes or until fluffy. Add the eggs, one at a time, whisking thoroughly between each addition. With the mixer on medium-low, slowly stream the sugar into the bowl; allow to fluff slightly. Slowly add the sour cream and vanilla to the mixer. Whisk until just combined and smooth. Remove the bowl from the mixer and gently fold in the diced peaches. 3. Remove the chilled crust from the refrigerator. Use a large piece of aluminum foil and wrap the spring from pan. This will help prevent the water from the water bath from penetrating the cheesecake. Place in a roasting pan. 4. Pour the filling into the prepared crust and gently smooth the top. 5. Carefully pour the boiling water into the pan until it reaches approximately halfway up the side of the cheesecake pan. 6. Place in the preheated oven and bake for 45 minutes. This will really depend on your oven. You want the center slightly giggly but the cheesecake mostly set. 7. Remove from the oven and carefully remove the cheesecake pan from the water bath. Allow to cool on the counter for at least 30 minutes. 8. Carefully cover with plastic wrap and chill in the refrigerator for 5-6 hours. 9. To make the topping, place the sugar, juice, and remaining peaches in a sauce pan and boil on medium low for 1 hour. Remove from heat and allow to cool. Place in a resealable container and chill in the refrigerator. 10. To serve, slice the cheesecake and then top with you peach syrup. I love sweet potatoes! However, I love the natural flavor and sweetness without all of the extra sugar. I am not saying that I do not appreciate a wonderfully gooey potato covered in cinnamon and brown sugar, but, when it comes to my wedges, I like them in their simplest form. This recipe only has 4 ingredients and is a great way to get your kids to eat their veggies because they are sweet, slightly salty, and baked! 2. Using a vegetable peeler, remove the skin from the potatoes. Cut each potato in half, lengthwise, and then cut into wedges. You should get 8 wedges per potato. 3. Place the wedges on a baking sheet. Drizzle with oil and then sprinkle with salt and pepper. 4. Bake for 17-20 minutes, turning once halfway through cooking. So when springtime starts to roll around, it is time to break out of the kitchen and move outdoors to the grill. While hamburgers and chicken are great, tonight, we wanted something a little different. The use of cornish hens in this recipe allows for a quicker cook of whole hens, as compared to whole chickens, and is nice enough to entertain with at your next cookout. Imagine everyone's surprise when you serve them their own small hen half instead of the typical BBQ chicken pieces. 1. To butterfly the hens, remove the backbone from the chickens and then press down on the breastbone to flatten. Make sure to turn the legs out so the thighs rest on the breast. 2. Combine the seasoning in a small bowl. Sprinkle over the skin of the hens. Using your hands, rub the dry seasoning into the skin. 4. Place the hens skin-side-down on a grill over low heat. Allow to cook for 12-15 minutes without moving. NOTE: THE COOKING TIME WILL DEPEND ON YOUR GRILL. YOU WANT LOW HEAT HERE TO CRISP AND NOT BURN THE SKIN. ALL COOKING TIMES ARE BASED ON COOKING WITH THE LID CLOSED ON A GAS GRILL. 5. Using tongs, flip the hens over and allow to cook for an additional 12-15 minutes or until the juices run clear or has reached an internal temperature of 165 degrees on a digital thermometer. 6. Brush 1 Tablespoon of your choice of sauce on the skin side of each of the cornish hens. Allow to cook for an additional 5 minutes. 7. Remove from the grill and cover with foil for 5 minutes. 8. Cut in half down the breast bone and enjoy! This recipe is a variation on a breakfast sandwich I typically enjoy at least one morning a week. I usually make the sandwich completely vegetarian. However, as you know, I have said that my husband is a true carnivore. So one morning, while making my husband's Bacon, Egg, and Cheddar Bagel, I could not control myself from stealing a couple of slices. The result is delicious! What I will say is that whether you make it with or without bacon, this is a great way to start your day! 1. In a large skillet, cook the 2 slices of bacon over medium heat until crisp, turning once. Remove from the pan and leave to drain on a paper towel. 2. If the pan has a large volume of grease, drain until just a thin layer of oil remains. Reduce heat to medium-low. 3. In a bowl, whisk the egg whites until slightly foaming. Pour into the egg whites into the pan and sprinkle with a pinch of salt and pepper. 4. In the other half of the pan, place the spinach leaves and allow them to begin to wilt. Gently stir. 5. After about 3 minutes, the egg white should be set on one side. If it is cooking too fast, reduce the heat. Using a spatula, carefully flip the egg white to cook the other side. 6. 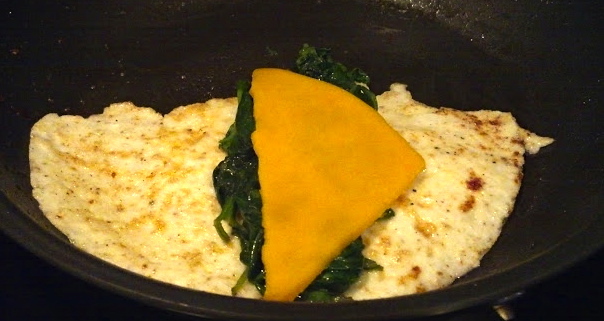 Place the sautéed spinach in the middle of the egg white and top with cheese. Fold the ends over the filling and allow the heat to melt the cheese. 7. While the filling is finishing, lightly toast the bagel. 8. 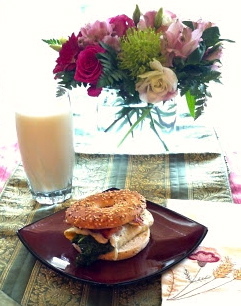 To construct your sandwich, layer the egg white filling on the bottom half of the bagel, followed by the cooked bacon and then topped with the bagel cap. I often get asked if I cook full meals every night of the week; the truth is that most nights, I do. I personally find cooking to be an escape after a long day at work. However, as much I as love to cook dinner, some nights, there is just not the time or energy. Instead of rushing out to the local fast food restaurant I like to pull from my stash of quick meals. Below is my top 5 go to make ahead dinners. With these on hand, you will be able to throw a dinner together any night of the week. 1. Meatball Lasagna: Having my meatball lasagna frozen in individual servings is a great way to have quick dinners or packed lunches. The noodles are still moist and the cheese is creamy. Every time I reheat this recipe, it tastes just as fresh as the day it was made. 2. Eggrolls: About once every 6 months or so, I make homemade egg rolls. Since all the wrappers need to be used up at the same time, I make about 30 rolls at a time. After much practice, I have found the best way to preserve and reheat. You will want to make sure to cook the rolls completely and then allow to cool. After they have come to room temperature, wrap them individually in aluminum foil and then lay in a freezer bag. These rolls are good for up to 6 months in the freezer stored this way. When you want to create a quick Asian dinner, simply place in a 450 degree oven for 10-12 minutes or until they are heated through. Heating them in this manner allows the crust to be crisp. Great quick side to go with my Pork Fried Rice! 3. Soup: Soups are a staple in make-ahead freezer meals. I have never found a soup that cannot be frozen. The key to eating frozen soup is to allow it to thaw for a day in the refrigerator before reheating. Soups, stews, chilis.....they are all great. I like to make a large pot of chicken soup and store the remainder for a later day. Nothing beats soup for a long day and cold night. 4. Pulled Pork: When we make BBQ in this house, we make A LOT of BBQ. Rather than throwing it away, we freeze the pork in vacuum bags. To reheat, simply heat in a skillet on low and add additional sauce. My favorite way to use up the pulled pork is with my BBQ Cheese Fries. If nothing else, the fries alone are a great reason to have leftover BBQ. 5. Kicked Up Chili: My final go to recipe from the freezer is my Kicked Up Chili. This chili is used for hotdogs, chili cheese burgers, chili fries, nachos, and, my personal favorite, chili dogs! To reheat, simply remove from the freezer, thaw in the microwave for 5 minutes, and then place in a skillet with a lid. Simmer on low for 10 minutes or until hot throughout. That is it! Super quick meal! We eat so much chicken in my house that I have to find ways to make it something new for dinner. 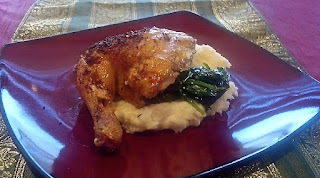 Oven roasted chicken is a standby for me, but tonight, I wanted something a little more elegant. I thought about romantic dinners we have shared and they all seemed to be filled with constructed food; what I mean is that they involve a stacking of food for presentation, usually a creamy starch topped with sautéed vegetables and then the meat. This recipe is an ode to romantic nights and weeknight dinners. Your guests will be impressed! 1. Using a pair of kitchen shears, cut the backbone out of the chicken. Place the chicken skin-side-up in a roasting pan with a wire rack. Using your hands, press the breast down in order to butterfly the chicken. You will feel the wishbone break. Tuck the wing tips under and make sure the chicken is lying flat. This will allow the chicken to cook more evenly and all the skin to crisp. 2. Brush the melted butter over the skin of the chicken. Sprinkle evenly with salt, pepper, and seasoning blend. 3. Place in a preheated oven and cook for 1 hour 20 minutes. While the chicken cooks, prepare the remainder of the meal. You will want to time the cooking times to make everything finished at the same time. 4. Fill a large pot with 8 cups of cold water. 5. Cut the peeled potatoes into 1/2 inch thick slices and place in the cold water. 6. With the burner on medium-high, bring the water to a boil. Once the water begins to boil, the potatoes will need about 20 minutes to become completely cooked. Use a knife to test the doneness of the potatoes. When you can insert the knife into the potato and feel no resistance, you are ready to move to the next step. 7. Drain the potatoes and then place back into the hot pot. Allow to sit for 1-2 minutes. This allows the excess moisture to leave the potatoes. Transfer to a mixer-safe bowl. 8. Using a hand mixer, beat the potatoes with the milk, butter, and cream. Continue to whip until they are fluffy. Add salt and pepper (you will need to add to taste) and stir. 9. Cover with plastic wrap until ready to serve. 10. 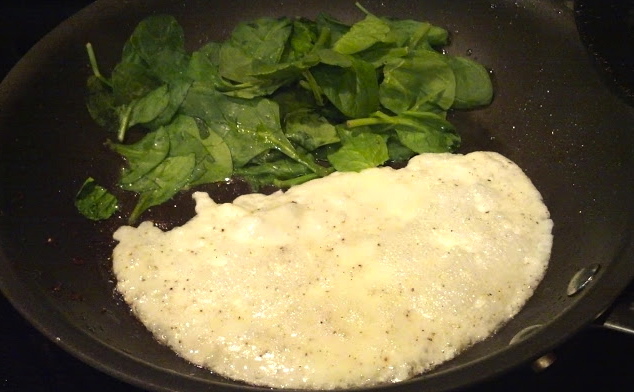 To prepare the spinach, melt the butter in a large skillet with minced garlic. Add the spinach and allow to gently wilt for 2-3 minutes, stirring frequently. Sprinkle with salt and pepper. To serve, simply allow the chicken to rest for 5 minutes before slicing and then cut between the joints and halve the breasts. Layer a base of potatoes, followed by spinach, and then topped with chicken. ENJOY! In this household, if there are two things we love, it is crispy chicken wings and Asian food. This recipe combines them both perfectly. 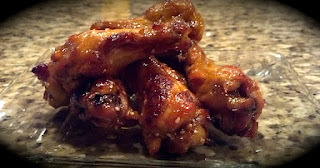 The great thing about my wing recipe is that they are baked, not fried. The baked wings allows for a much healthier version of the traditional wings and also requires much less active cooking than standing over a large pot of hot oil. We use this cooking method for wings all the time with variations on the sauces. This sauce recipe is sweet and spicy with a nice balance of flavors! 2. Arrange the wing segments on a large baking sheet fitted with a wire rack that has been sprayed with cooking oil. Place in the oven and bake for 1 hour. 3. In a measuring cup, combine the remaining ingredients, minus sesame seeds. Set aside until ready to coat the wings. 4. After 1 hour, the wings should be brown and crisp. If they are not, give them a little longer. Once they have become brown, remove from the oven and place in a large bowl. Pour the sauce over the wings and toss to coat. 5. Place the wings back on the baking rack. Sprinkle with sesame seeds. 6. Bake for another 15 minutes.